Film without music is a bizarre experience. It is theoretically possible to edit out non-story musical moments from any film – all that is required is the audio stems and a big mute button. The experience would be cold, mildly alluring, and tremendously disjointed. Film scores, often referred to as “the background music,” are clever editing tools to guide an audience through complex story concepts; musical themes signal to the audience that this character has that relationship with this event. Repeat these musical motifs and there exists a complementary story line and tools to tell it. The themes, tone, and timbre of a film are all usually told through a musical story. There is sufficient cause to praise scores within and without the context of their respective films and there is sufficient reason to know of these composers: John Williams, Howard Shore come to mind. Schindler’s List and The Lord of The Rings are treated as masterful because of the treatment of tone via music. There is instead a different take with movie musicals – in which the music is the purpose – and the dialogue serves as transitory at best. This is also different from operatic performance, in which the transitory dialogue is the music. The music is almost always cloyingly nice or dramatically silly. There is room for comedic musicals and overdramatic musicals on purpose. Musicals are marketed as universal and inoffensive – even ones that deal in subjects whose accompanying music sanitizes horror or deleterious violence. And parents will take their children to see them because enjoying music is a universal human trait, innate to children and there is no need to explain what music is to a toddler or pre-teen. Their purpose is to entertain, and they almost uniformly do. There is no objective rub with film or stage musicals. Les Misérables has been seen and not read for over a century, the first of whose adaptations appeared on screen in film’s first foray, J. Stuart Blackton’s 1909 take. Victor Hugo’s marvelous epic tale is historically rigorous, characteristically clear, and obviously adaptable to be acted, directed, and enjoyed. For 118 years, until 1980, Les Misérables was a film trafficked in dialogue, in characterization, in setting, and in continuity. But in 1980, music, now almost ubiquitous songs like “I Dreamed a Dream” and “Master of the House” define the story and frame it as an experience whose story is meant to sell the songs. And it has been wildly successful. 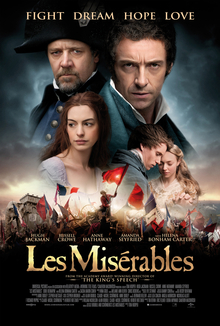 Les Misérables’ 2012 adaptation was nominated for Best Picture, the film that best represented the world’s pulse for the year. It, however, was not the first version of this film to do so: 1935’s fifth adaptation (of now 17 overall) was filmed and nominated first. Despite the media narrative, 1935’s version is a better, more succinct and narratively sound version of Hugo’s original. It does not have songs (which were written in the late 1970s) and barely a score. But this film captures Hugo’s existential despair better than 2012’s cartoonish take. The success of 1935’s Les Misérables has roots in the limited technological ability of the time, so director Richard Boleslawski’s version required the earnestness and commanding presence of Fredric March’s Jean Valjean and Charles Laughton’s Inspector Javert to carry it; Tom Hooper’s 2012’s Hugh Jackman/Russel Crowe combination provided a vessel for the dialogue and lyrics, but ultimately half-commanded the screen, which emphasized theatrics and framing over keen acting performance. The strength of the music carried the later film, but its ultimate sterility fundamentally violates Hugo’s tale of despair and sacrifice. It is a chore to watch all 160 minutes of Hooper’s film. Also, and not to be understated, Russell Crowe cannot sing, nor realistically would Javert have any narrative reason to. March’s performance is emotionally staid and deliberately paced; Laughton’s Javert is overly earnest, but within the range of the character. Strict interpretation of Law, even in the face of Injustice, he could not square, and it sets up Javert as a byproduct of tragedy in a particularly tragic Revolutionary era. Crowe’s Javert is uncomplicated and acts outlandishly stern, without any of the emotional depth that audiences need to sympathize with him. Similarly, March’s Valjean is equally as earnest and his careful facial expressions and tempestuous relationship with Good and Evil shine especially when taking Javert as a foil. Jackman plays Valjean’s favor toward Good with stubborn torpidity. Not once do we question Jackman’s desire to Do Good when Bad is equally tempting, regardless of misaligned monarchical law. But the music is fun. Two-thousand twelve’s Les Misérables doesn’t feel right, it doesn’t feel substantial, and it doesn’t feel distinct enough to matter. This is not a problem with the film and it doesn’t disqualify it from nomination and it certainly doesn’t disqualify it from enjoyment. But it could never win Best Picture. If we care that the award’s distinction matters – that in a half-century Americans will try to piece back together 2012’s culture state, and if we think that 2012’s Best Picture winner, Argo, sufficiently does this, then we’ll have missed the point. Argo is a fine movie. It’s procedural, emotional, historical, and non-controversial. Silver Linings Playbook needed to win this award though if 2068 audiences are going to think we took mental health seriously. They don’t because we won’t. The year chose from a wide variety; other nominees included: Amour, Beasts of the Southern Wild, Django Unchained, Lincoln, Life of Pi, and Zero Dark Thirty. Despite its faithful and dramatically honest rendition of Victor Hugo’s Les Misérables, it did not win Best Picture in 1935 (that honor went to Mutiny on the Bounty, also starring Charles Laughton). Mutiny was an immensely popular film and it was highly regarded as a masterpiece in its time. It hasn’t aged remarkably well. In 1935, the second of four Broadway Melody films would be nominated, as well as adaptations of David Copperfield and A Midsummer Night’s Dream. We’ll see which film should represent 1935: so far it is this iteration of Les Misérables, the better of the two remakes to have been nominated of all time.